A red granite colossus of the ancient Egyptian deity of wisdom, Thoth, was unearthed at the north-western side of King Amenhotep III’s funerary temple on the west bank of Luxor. Only up the road from me. 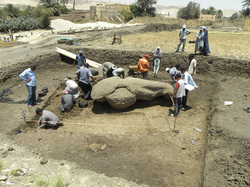 Minister of Culture Farouk Hosni announced the find today, explaining that the statue is 3.5 meters tall and 140 cm wide, and was discovered during routine excavations carried out by an Egyptian archaeological team led by Dr. Zahi Hawass, Secretary General of the Supreme Council of Antiquities (SCA). Hawass said that evidence at the site where the colossus was found suggests that more colossi could be found here, as a similar statue 5 meters in height was discovered there last year. Afifi Rohayem, the assistant of the mission’s director, said that the site could contain an avenue of Thoth statues that once outlined the original path leading to the temple. Traces of these colossi were first uncovered at the site during the execution of a development project aimed at controlling the subterranean water level on Luxor’s west bank. As part of the process Dr. Hawass assigned a special excavation mission to explore the site.